Secret of beautiful hair lies… in the field! Sounds funny? You can’t believe it? Evening primrose is a small, common plant that can be found on almost every meadow. Out of over one hundred species found in the primrose family, it is a widely accessible evening primrose that works perfectly in hair care. Evening primrose oil is extremely valuable. Learn the secret of simple and very effective hair care. All you need is evening primrose oil and a little effort. Find out about the plant and its properties. It is a plant that is popular in the regions of Europe and America. 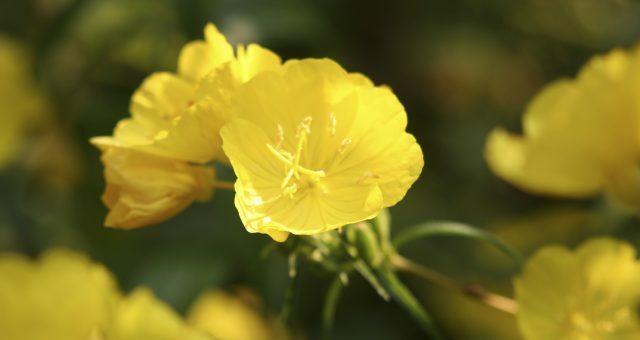 It belongs to the evening primrose family that includes 120 species. Interestingly, it is hard to tell them apart. They are very similar. Evening primrose has a stem, small oval leaves and large flowers of characteristic yellow colour. Evening primrose oil is extracted from little brown seeds. vitamin complex (e.g. vitamin E, F). Evening primrose oil belongs to the group of non-penetrating oils of large particles. However, it is quite lightweight and easily fits the structure of high porosity hair. It seals its cuticles, therefore provides protection as well as repair. What are the properties of evening primrose oil? Evening primrose oil has been used in skin, hair and nails care for ages. It is an ingredient of many natural cosmetics – creams, masks, serum, etc. Cosmetic companies appreciate its valuable qualities and large amount of substances which are ideal in daily beauty care. What benefits can evening primrose oil bring if we apply it regularly to hair? Triggers quicker restoration and regeneration of cells. Rebuilds damage e.g. caused by hairstyling treatments. Protects hair from further damage.